To recognize and celebrate the significant legacy of University of Mississippi Chancellor Emeritus Robert C. Khayat, the Ole Miss Women’s Council for Philanthropy (OMWC) has created a scholarship endowment in the leader’s name. Khayat was chancellor when the OMWC was formed and has continued to be a source of support and encouragement to the council, calling its scholarships some of the most “innovative in the nation.” In addition, Khayat established an OMWC scholarship to honor the contributions and support of his wife, Margaret, in her role as the university’s First Lady. The Ole Miss Women’s Council Robert C. Khayat Endowment was established with an initial gift of $135,000 raised through the success of the 2016 Legacy Award Dinner, during which Khayat was named recipient of the prestigious award. Scholarship recipients will be full-time entering freshmen who have demonstrated academic ability and leadership potential. In addition to maintaining a 3.0 grade-point average through eight semesters of scholarship eligibility, the student must participate in leadership development and mentoring sponsored by the OMWC. Khayat said he considers the endowment a great honor. 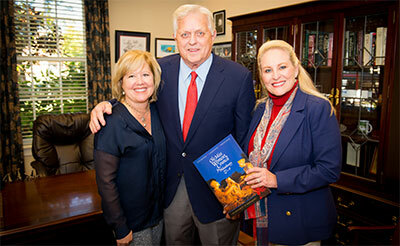 The Ole Miss Women’s Council Robert C. Khayat Endowment is open to gifts from individuals and organizations. To contribute, send checks with the endowment name noted in the memo line to the University of Mississippi Foundation, 406 University Ave., University, Miss. 38655; visit www.umfoundation.com/makeagift. For more information on the OMWC, visit omwc.olemiss.edu or contact Nora Capwell at ncapwell@olemiss.edu or 662-915-2384. The OMWC is an innovative program that provides scholarships and counsel for students destined to be leaders. Helmed by an accomplished cadre of female leaders and philanthropists, the OMWC provides scholarships for tuition and books for young men and women as well as guidance and training in leadership skills, career development and personal growth throughout the students’ tenure at the university. Scholars are guided by career mentors and sitting members of the OMWC and participate in leadership training, mentoring, community service projects, cultural enrichment activities and alumni networking. As chancellor, he helped found an honors college and institutes of international studies, leadership, and racial reconciliation. He secured a coveted Phi Beta Kappa chapter, attracted millions in private support and hosted the 2008 Presidential Debate. He transformed the campus through renovation, landscaping and construction — including adult and children’s hospitals, a chapel, a performing arts center and an indoor athletics practice facility. Under Khayat’s leadership, student enrollment increased by 43 percent and the University’s budget grew from $500 million to $1.5 billion annually. In addition to his work at Ole Miss, Khayat served as a member of the board of directors for Sanderson Farms Incorporated, the United Southern Bank, Mississippi Valley Title Insurance Company, The Joseph Bancroft Foundation, Mississippi Power Company and The Newseum. Khayat’s achievements and awards include: Barnard Distinguished Professor of Law, NCAA Foundation president, NFL Lifetime Achievement Award, National Football Foundation Distinguished American Award, Innovate Mississippi’s Legend Award, Ole Miss Student and Alumni Halls of Fame, and Mississippi Sports Hall of Fame. A memoir by Khayat, “The Education of a Lifetime,” was selected for the University’s 2015 Common Reading Experience. Each incoming freshman received a copy of the book and was encouraged to read it before Khayat spoke at the fall convocation. Khayat joined a prestigious list of Legacy Award recipients, including such recognized names as Charles Overby, award-winning journalist and First Amendment rights champion; Donna and Jim Barksdale, founder of the web browser Netscape, entrepreneurs and philanthropists; Mississippi Gov. William and Elise Winter, education, community and racial reconciliation advocates; Olivia Manning, wife and mom to “America’s First Family of Football” and community leader; and Leigh Ann Tuohy, the inspiration for the movie “The Blind Side,” motivational speaker and interior designer.